In winter the Haliburton Highlands become a playground for snow based activities. Cross country skiing, skating, snowmobiling and ice fishing are available directly at the Resort while dogsledding, downhill skiing and snowshoeing and luge are nearby. Skate on beautiful Mountain Lake. We maintain a large rink on the Lake – great for a family outing or a pickup game of hockey. Try a romantic skate under the stars – we light the rink at night. Nearby Sir Sam`s Ski and Bike offers excellent downhill skiing without lineups. 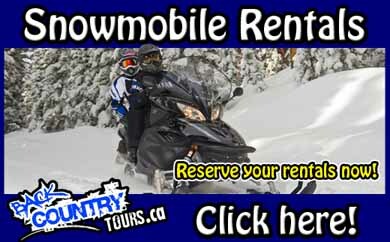 Ogopogo Resort offers discounted lift tickets and "Learn to Ski or Snowboard" package discounts. Ogopogo Resort teams up with Haliburton Forest to offer dogsledding excursions. Professional mushers and s make your adventure one you will soon not forget. We offer promotion pricing off your stay with us fi reserving a Dog Sledding adventure as part of your package. From Ogopogo, access over 600 km of groomed trails in Haliburton County with links to the rest of the province. Bring your own machine or contact us to arrange a rental. A fast growing sport in Haliburton County. The Leslie Frost Centre trails, Moose Woods Recreational trails and Snowdon Park Preserve are all within 20 minutes of Ogopogo.